Only female mosquitoes bite. Both male and female feed mainly on fruit and plant nectar, but the female also needs the protein in blood to help her eggs develop. Once she's had her fill of blood, she'll rest for a couple of days before laying her eggs. Mosquitoes don't have teeth. The females “bite” with a long, pointed mouthpart called a proboscis. They use the serrated proboscis to pierce the skin and locate a capillary, then draw blood through one of two tubes. The average mosquito lifespan is less than two months. Males have the shortest lives, usually 10 days or less, and females can live about six to eight weeks, under ideal conditions. The females lay eggs about every three days during that time. Females of species that hibernate may live up to six months. Mosquitoes have six legs. They also have a head, thorax and abdomen. On the head are two large compound eyes, two ocelli (simple eyes), two antennae and a proboscis. Two large, scaled wings sprout from the thorax. Mosquitoes can't fly very far or very fast. 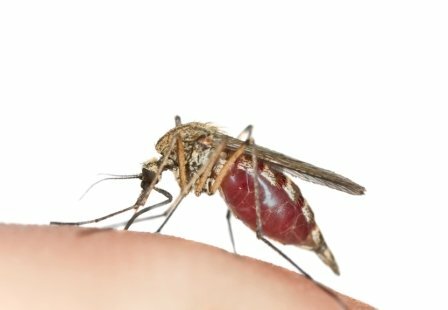 Most mosquitoes can fly no more than about one to three miles, and often stay within several hundred feet of where they were hatched. However, a few salt marsh species can travel up to 40 miles. The top speed for a mosquito is about 1.5 miles per hour. The two main mosquito predators are fish and dragonflies. Gambusia, or mosquitofish, feed on mosquito larvae and are used all over the world to help control mosquito populations. Dragonfly larvae, called nymphs, eat mosquito larvae, and adult dragonflies prey on adult mosquitoes. Some towns in Maine release dragonflies every summer as a natural form of mosquito control. Mosquito traps can kill thousands of mosquitoes in a single night. One study conducted by public health researchers in Australia found that a Mega-Catch™ trap caught and killed more than 44,000 female mosquitoes from 17 species in less than two weeks.